In a fun and informal chess tournament to thank educators for their valuable contribution to the Tsogo Sun Moves for Life Chess programme, 110 educators from nine primary schools in the West Rand area pitted their skills against each other in a series of friendly games and quizzes on Monday, 17th September at Silverstar Casino, which sponsors the programme in the area. Nationally, Tsogo Sun Moves for Life operates in 57 schools around the country, with 23 766 participating learners, 569 educators, and 22 tutors from the local communities. The programmes are sponsored by eight of Tsogo Sun’s casinos, which also sponsor annual chess tournaments for learners from the schools in their catchments areas, as well as separate chess tournaments for the teachers, to give them a well-earned break from teaching for a day. The teachers are from Avante primary school, F.J wells primary school, Hartzastraat primary school, Mashudu primary school, Mohlakano primary school, Nooitgedacht primary school, Paardekraal primary school and Randfontein primary school. 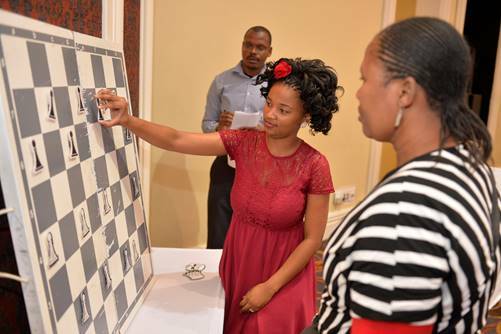 Says Shanda Paine, Tsogo Sun Group CSI Manager, “The aim of the Moves for Life chess programme is to use chess as an education tool that helps to improve maths, science, and problem-solving in learners – particularly in disadvantaged areas. We’re extremely aware that the strength of the programme is dependent on the dedication, enthusiasm, hard work that the teachers put in, as well as the sacrifices that they make to ensure the success of the programme. We’re indebted to them and this is one way we can treat them to a day of entertainment and fun at our participating casinos.” The tournament also serves as social year-end event for the teachers in the programme. In the Teacher Tournaments different work stations are set up where the teachers compete in friendly games such as quizzes and board games that test their chess knowledge, as well as the classroom activities and integrated lessons that they have implemented during the year. This is the second year that Tsogo Sun Moves for Life Teacher Tournaments have been hosted. “The teachers are very enthusiastic about these tournaments – and every year the numbers of participating teachers increases. Not only is it a day of fun, but they also say they enjoy networking with teacher colleagues from other schools, and the chance to pick up ideas and suggestions on how to improve their own lessons,” adds Paine. As these are not formal tournaments, there is no overall winning teacher or school, but there are constant small prizes that are won at every work station during the course of the games. “We’re delighted at the growth and success of the Tsogo Sun Moves for Life chess programme over the past few years and proud of the youngsters who are moving up to participate in major chess championships around the country, but we’re also thrilled that the programme is proving to be an effective tool that is equipping teachers to master maths concepts, which in turn is helping children to master the basic building blocks of maths in a fun and incidental way,” says Paine.